March 7, 2007–OVW TV Tapings: Atlas DaBone defeated “The Big Deal” Daniel Rodimer in a Tug of War Contest..
March 14, 2007–OVW TV Tapings: “The Big Deal” Daniel Rodimer defeated Atlas DaBone in a Weightlifting Contest..
March 24, 2007–Ohio Valley Wrestling: Atlas DaBone defeated Ramon Loco..
March 28, 2007–OVW TV Tapings: Daniel Rodimer defeated Atlas DaBone in a Grudge match..
April 18, 2007–OVW TV Tapings: Mike Kruel w/Milena Roucka defeated Atlas DaBone..
April 21, 2007–Ohio Valley Wrestling: Atlas DaBone defeated K.C. James..
May 2, 2007–OVW TV Tapings: Atlas DaBone defeated Nickolas Sinn in a dark match..
May 9, 2007–OVW: Johnny Jeter & Atlas DaBone & ODB & ???? beat Vladimir Kozlov & Mr. Strongko & Beth Phoenix & ????.. May 16, 2007–OVW TV Tapings: Mike Kruel defeated Atlas DaBone..
May 19, 2007–Ohio Valley Wrestling: Jay Bradley defeated Atlas DaBone..
May 23, 2007–OVW TV Tapings: Atlas DaBone defeated Pat Buck..
May 30, 2007–OVW TV Tapings: Atlas DaBone beat Kassidy James (1st Round) | Atlas DaBone beat Mike Kruel (2nd)..
~~~Atlas DaBone beat Anthoni Polaski in the Finals to earn the right to face Mike Mizanin at Six Flags on June 8..
June 1, 2007–OVW Six Flags: Atlas DaBone defeated Dirty Money..
June 8, 2007–OVW Six Flags: Atlas DaBone defeated Mike “The Miz” Mizanin..
June 13, 2007–OVW TV Tapings : Atlas DaBone defeated Nickolas Sinn in a dark match..
June 17, 2007–Ohio Valley Wrestling : Jay Bradley defeated Atlas DaBone to retain the OVW Heavyweight title..
June 20, 2007–OVW TV Tapings: Atlas DaBone defeated Chris Cage in a dark match..
June 22, 2007–OVW Six Flags: Vladimir Kozlov defeated Atlas DaBone..
July 4, 2007–OVW TV Tapings: Dirty Money & Atlas DaBone defeated Jamin Olivencia & T.J. Dalton in a Gauntlet Match..
~~~Dirty Money & DaBone beat Terminal Velocity | Dirty Money & DaBone beat The Belgian Brawler & Vladimir Kozlov..
~~~Charles Evans & Justin LaRoche defeated Dirty Money & Atlas DaBone to earn the right to face Cryme Time on 7/13..
July 18, 2007–OVW TV Tapings: Atlas DaBone participated in a Royal Rumble for the right to face John Cena on 7/27..
July 21, 2007–Ohio Valley Wrestling: Atlas DaBone defeated Idol Stevens in Owensboro, Kentucky..
July 25, 2007–OVW TV Tapings: Atlas DaBone defeated Johnny Punch in a dark match..
July 25, 2007–OVW TV Tapings: Al Snow’s Team vs. Vladimir Kozlov’s Team in a 5-on-5 match ended in a No Contest..
~~~A.Snow & I.Stevens & The Jett & A.DaBone & C.Cabana vs. V.Kozlov & M.Kruel & The Belgian Brawler & Los Locos..
July 28, 2007–OVW: Chet the Jett & C.Cabana & A.DaBone & I.Stevens beat Mike Kruel & Vladimir Kozlov & The Akbars..
July 28, 2007–OVW (Night): M.Kruel & Belgian Brawler & The Akbars beat A.DaBone & I.Stevens & C.Cabana & Chet the Jett..
August 10, 2007–OVW Six Flags : Team Snow defeated Team America w/Milena Roucka in an 8-Man Tag Team match..
~~~Al Snow & Colt Cabana & Chet the Jett & Atlas DaBone defeated Mike Kruel & Vladimir Kozlov & The Akbars..
August 12, 2007–Ohio Valley Wrestling: Vladimir Kozlov defeated Atlas DaBone in Louisville, Kentucky..
August 15, 2007–OVW TV Tapings: Scott Cardinal & Atlas DaBone defeated Charles Evans & Justin LaRoche..
August 22, 2007–OVW TV Tapings: Atlas DaBone defeated Jay Bradley in Louisville, Kentucky..
August 29, 2007–OVW TV Tapings: Atlas DaBone defeated “The Professional” Mike Mondo..
September 5, 2007–OVW TV Tapings: Atlas DaBone defeated Adam Revolver..
September 12, 2007–OVW TV Tapings: Atlas DaBone defeated Dirty Money..
September 14, 2007–Ohio Valley Wrestling: Atlas DaBone defeated Derrick Neikirk in Hillview, Kentucky..
September 15, 2007–Ohio Valley Wrestling: Atlas Dabone defeated Vladimir Kozlov in Cincinnati, Ohio..
September 19, 2007–OVW TV Tapings: Atlas DaBone defeated Antoni Polaski in Louisville, Kentucky..
September 26, 2007–OVW TV Tapings: Atlas DaBone defeated Justin “The Ox” LaRoche..
October 3, 2007–OVW TV Tapings: Atlas DaBone defeated Anthony Vain in Louisville, Kentucky..
October 10, 2007–OVW TV Tapings: Atlas DaBone defeated K.C. James in Louisville, Kentucky..
October 17, 2007–OVW TV Tapings: Atlas DaBone defeated Los Locos in a Handicap match..
October 19, 2007–Ohio Valley Wrestling: Atlas DaBone defeated Andrew Vain in Hillview, Kentucky..
October 24, 2007–OVW TV Tapings: Atlas Dabone defeated Vladimir Kozlov by DQ after the Insurgency interfered..
October 29, 2007–RAW: Atlas DaBone defeated Kenny Dykstra in a dark match..
October 31, 2007–OVW TV Tapings: Los Locos & Atlas DaBone defeated The Insurgency & Vladimir Kozlov..
November 7, 2007–OVW TV Tapings (Airs 11/17): Atlas DaBone defeated Mike Kruel w/Milena Roucka in a Non-title match..
November 12, 2007–RAW: “Hacksaw” Jim Duggan defeated Atlas DaBone (from OVW) in a dark match..
November 14, 2007–OVW TV Tapings (Airs 11/24): Atlas DaBone & Katie Lea defeated Mike Kruel & Milena Roucka..
November 14, 2007–OVW TV Tapings (Airs 12/01): Mike Kruel defeated Atlas DaBone to retain the OVW Heavyweight title..
December 3, 2007–RAW: Atlas DaBone defeated Vladimir Kozlov in a dark match..
December 12, 2007–OVW TV Tapings: Atlas Dabone defeated OVW Champion Matt Sydal by DQ after Mike Kruel interfered..
December 17, 2007–RAW: Drew McIntyre defeated Atlas DaBone in a dark match..
December 19, 2007–OVW TV Tapings: Matt Sydal defeated Mike Kruel and Atlas DaBone in a 3-WAY to retain the OVW Title..
January 2, 2008–OVW TV Tapings: Atlas DaBone defeated Mike Kruel w/Milena Roucka in the 1st Match of the Best of 3 Series..
January 7, 2008–RAW: Atlas DaBone defeated Nick Nemeth w/Big Rob in a dark match..
January 9, 2008–OVW TV Tapings: Atlas DaBone defeated Mike Kruel w/Milena Roucka in the 2nd Match of the Best of 3 Series..
January 16, 2008–Ohio Valley Wrestling: Team America defeated Atlas DaBone backstage..
June 3, 2008–Florida Championship Wrestling: Atlas Dabone defeated Ted Dibiase Jr. in a #1 Contenders Match. June 17, 2008–Florida Championship Wrestling: Atlas Dabone defeated Sinn Bowdee..
July 1, 2008–ECW on Sci Fi: Atlas Ortiz (debut) defeated Armando Estrada..
July 8, 2008–ECW on Sci Fi: Atlas Ortiz changed his name to Ricky Ortiz (because Tony Atlas became an on-air character)..
July 29, 2008–ECW on Sci Fi: Ricky Ortiz defeated Chavo Guerrero by DQ after Bam Neely interfered – Evan Bourne made the save! August 5, 2008–ECW on Sci-Fi: Evan “Air” Bourne & Ricky Ortiz defeated Chavo Guerrero & Bam Neely in a tag team match..
September 2, 2008–ECW on Sci-Fi: Ricky Ortiz defeated SmackDown!’s Ryan Braddock to improve his winning streak to 5-0..
September 2, 2008–Florida Championship Wrestling: Johnny Prime & Ricky Ortiz defeated Sheamus & Sinn Bowdee. September 16, 2008–ECW on Sci-Fi: Evan Bourne w/Ricky Ortiz defeated Mike “The Miz” Mizanin w/John Morrison..
September 23, 2008–ECW: Morrison vs. Miz ended in a Double Count-down in a match where the winner was to face Ricky Ortiz..
September 30, 2008–ECW on Sci-Fi: Mark Henry & John Morrison & The Miz beat Matt Hardy & Evan Bourne & Ricky Ortiz..
October 7, 2008–ECW: Miz & Morrison & C.Rhodes & T.DiBiase w/Manu beat CM Punk & K.Kingston & E.Bourne & R.Ortiz..
October 8, 2008–FCW: Ricky Ortiz & T.J. Wilson & Johnny Prime defeated Kafu & Drew McIntyre & Brian Kelly. October 10, 2008–Florida Championship Wrestling: Johnny Prime & Ricky Ortiz defeated Mike Kruel & Jack Gabriel w/Alicia Fox. October 23, 2008–Florida Championship Wrestling: Stu Bennett & Black Pain w/Bryan Kelly defeated Kafu & Ricky Ortiz. October 30, 2008–Florida Championship Wrestling: Ricky Ortiz defeated Ezekiel Jackson. November 4, 2008–ECW on Sci-Fi: Ricky Ortiz defeated Jon Davis in a squash match to improve his winning streat to 6-0..
November 6, 2008–FCW: Joe Hennig & Ricky Ortiz & Johnny Prime defeated Gavin Spears & Tyson Tarver & Sheamus. November 13, 2008–Florida Championship Wrestling: Ricky Ortiz defeated Kizarny (formerly Sinn Bowdee)..
December 2, 2008–ECW on Sci-Fi: Jack Swagger defeated Ricky Ortiz in a #1 Contenders match to end Ortiz’ winning streak..
December 4, 2008–Florida Championship Wrestling: Ricky Ortiz & Tiffany defeated Ryan Braddock & Roucka. December 11, 2008–FCW: Ricky Ortiz & Scotty Goldman & Kizarny defeated Dolph Ziggler & Jack Swagger & Gavin Spears. December 16, 2008–ECW: John Morrison & Mike Mizanin & Jack Swagger defeated Ricky Ortiz & C.M. Punk & Kofi Kingston..
January 8, 2009–FCW: Sheamus O’Shaunessy & Ryan Braddock & Bam Neely defeated Tyler Reks & Ricky Ortiz & Kizarny. January 13, 2009–ECW on Sci-Fi: Ricky Ortiz was about to make out with Tiffany when Hornswoggle interrupted the romance..
January 20, 2009–ECW on Sci-Fi: Ricky Ortiz defeated Adam Evans in a squash match..
January 22, 2009–FCW: Kizarny & Ricky Ortiz & D.J. Gabriel defeated Caleb O’Neal & Lawrence Knight & Tyson Tarver. January 27, 2009–ECW on Sci-Fi: The Boogeyman vs. Ricky Ortiz didn’t happen because Ortiz retreated after a sneak attack..
January 29, 2009–FCW: S.Goldman & Ricky-O & D.Darsow & Kizarny beat D.McIntyre & L.Knight & B.Wilcott & C.O’Neal. February 12, 2009–FCW: Tiffany talked to Sheamus O’Shaunessy about ECW (Sheamus insulted ECW and fought with Ricky Ortiz). February 19, 2009–FCW: Tiffany interviewed Ricky Ortiz (Sheamus O’Shaunessy appeared and brawled with Ricky Ortiz). 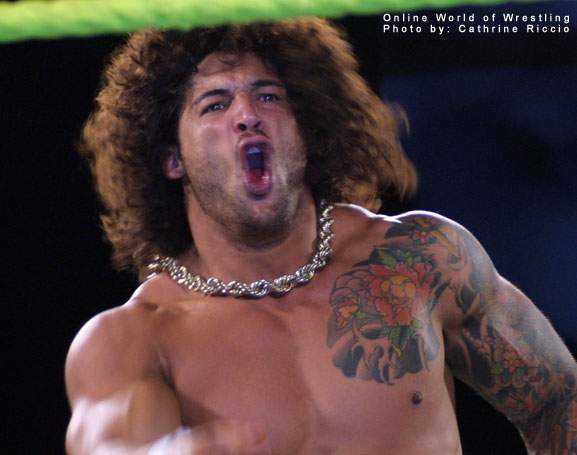 February 26, 2009–Florida Championship Wrestling: Ricky Ortiz defeated Ryback. February 26, 2009–Florida Championship Wrestling: Sheamus O’Shaunessy defeated Ricky Ortiz. March 10, 2009–ECW on Sci-Fi: Ricky Ortiz participated in a Money in the Bank Qualifying Battle Royal (won by Christian)..
March 13, 2009–FCW: Tyson Kidd & Ricky Ortiz & Sebastian Slater defeated DH Smith & Trent Barretta & Caylen Croft..
~~~~Tyler Reks & Johnny Curtis defeated Sheamus O’ Shaunassy & Drew McIntyre to retain the FCW Tag Team Titles..
~~~~~~~~~~~~~~~ After interference from Trent Barretta & Caylen Croft (Ricky Ortiz & Sebastian Slater made the save). March 20, 2009–Florida Championship Wrestling: Ricky Ortiz defeated Fletcher Chase (Jason Garrison). March 26, 2009–FCW: Sheamus O’Shaunessy defeated “The Latin Assassin” Ricky Ortiz by DQ after Eric Escobar interfered. April 13, 2009–RAW (Draft Special): Ricky Ortiz (ECW) was in the Double Draft Pick 15-Man Tri-Branded Battle Royal..
May 1, 2009–SmackDown! : Mike Knox defeated Ricky Ortiz in a dark match..
May 7, 2009–FCW: Ortiz & Eric Escobar & Sheamus & Johnny Prime beat Drew McIntyre & DH Smith & Justin Angel & Alex Riley. May 14, 2009–FCW: Tyson Kidd & David Hart Smith w/Natalya Neidhart defeated Ricky Ortiz & Sheamus O’Shaunessy. May 15, 2009–SmackDown! : Jeff Hardy defeated Ricky Ortiz..
May 22, 2009–SmackDown! : John Morrison & Shad Gaspard & JTG defeated Shelton Benjamin & Charlie Haas & Ricky Ortiz..
June 18, 2009–FCW: Ricky Ortiz competed in a 14-man battle royal to earn a title shot which was won Johnny Curtis. June 19, 2009–SmackDown! : R-Truth & Cryme Tyme defeated Shelton Benjamin & Charlie Haas & Ricky Ortiz..
June 19, 2009–Florida Championship Wrestling: Ricky Ortiz defeated Ezekiel Jackson. June 28, 2009–Florida Championship Wrestling: David Hart Smith & Tyson Kidd w/Natalya defeated DJ Gabriel & Ricky Ortiz. July 2, 2009–Florida Championship Wrestling: Ricky Ortiz competed in a battle royal which was won by Johnny Curtis. July 3, 2009–SmackDown! : Fit Finlay defeated Ricky Ortiz..
July 9, 2009–WWE Superstars: R-Truth defeated Ricky Ortiz..
July 16, 2009–Florida Championship Wrestling: The Rotundo Brothers (Bo & Duke Rotundo) defeated Mr. Tarver & Ricky Ortiz. July 17, 2009–SmackDown! : Layla El was babyface in her hometown (Miami) and got into a confrontation with Ricky Ortiz..
August 6, 2009–Florida Championship Wrestling: Yoshi Tatsu and Tiffany defeated Ricky Ortiz and Alicia Fox. August 7, 2009–SmackDown! : The Great Khali w/Ranjin Singh defeated Ricky Ortiz in a squash match..
August 8, 2009: Ricky Ortiz was unexpectedly released by World Wrestling Entertainment..
August 15, 2009–World Wrestling Council: Shane Sewell defeated Ricky Ortiz to retain the WWC Puerto Rican Heavyweight Title.. After the match Ricky Ortiz attacked Shane Sewell..
February 5, 2010–Combat Championship Wrestling: Shawn Spears defeated Ricky Ortiz in St. Petersburg, Florida..
February 26, 2010–Combat Championship Wrestling: Jesse Neal and Ricky Ortiz defeated Sinn Bodhi and Shawn Spears..
June 12, 2010–I Believe in Wrestling: Ricky Young defeated Damien Darling in Orlando, Florida..
June 25, 2010–WWA: Bruce Santee defeated Ricky Young in Melbourne, Florida..
July 24, 2010–I Believe in Wrestling: Ray Beez defeated Rick Young..
November 6, 2010–Vintage Wrestling: Ricky Ortiz defeated Shooter Storm..
December 4, 2010–CCW: Pablo Marquez defeated Ricky Young by disqualification..
January 8, 2011–I Believe in Wrestling: Rick Young defeated Mike Reed..
January 15, 2011–Vintage Wrestling: Kennedy Kendrick defeated Ricky Young..
January 29, 2011–I Believe in Wrestling: Ricky Young w/Scott Hall defeated Jack LeDuc in Orlando, Florida..
June 3, 2011–UWF: Rasche Brown defeated Ricky Ortiz. July 30, 2011–FUW: Ricky Ortiz defeated JD Maverick. September 10, 2011–IWA Florida: Ricky Ortiz and Rico Suave defeated Danny Demanto and Justin Cage to win the tag team titles. October 14, 2011–FUW: Ricky Ortiz, Damien Angel and Deimos defeated Eric Cooper, Michael Zaki and Francisco Ciatso. December 6, 2011–UWF: Slymm defeated Ricky Ortiz. December 28, 2013–Extreme Rising: Ricky Ortiz defeated Homicide.